I just love Tapsilog Bentos! It feels like such a long time since I last had faces looking at me from my bento. And today felt as good as any other to have some again. A cute take on the classic Filipino combination meal, Tapsilog (A portmanteau of TAPa – cured beef, SInangag – fried rice, and ITlog – egg). But while Tapsilog usually calls for runny sunny-side up eggs, I decided to go two ways on the log part. 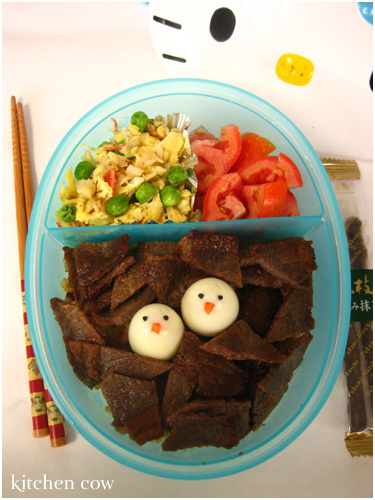 Scrambled since it’s more bento-friendly (it stays tasty longer) and hardboiled quail eggs because they’re cute. â€¢ Tapa, thin beef steaks that are cured in salt and spices, then fried. â€¢ Sinangag, pinoy-style Fried Rice. Unlike Chinese-style fried rice which is loaded with meat and veggie, Filipino sinangag is pretty plain. It’s usually just rice, quickly stir-fried in oil leftover from cooking viands like Tapa and Adobo. Because the used oil retains the flavors of the meat cooked in it, the rice becomes infused with meaty goodness. â€¢ 1-2 cups cooked rice. Day old rice is best because the grains separate easily. Even better is using day old Long Grain rice like Jasmine because they’re less clumpy and allows even cooking. â€¢ 1-2 tbsps of fresh leftover oil. Note the fresh part. What we usually do is fry our viands like tapa, then remove all but a little oil from the frying pan. Think of it as drippings from a roast. Cooking your rice in the same pan where you cooked your viand leaves little flavorful meat bits too. â€¢ a few cloves of garlic, peeled then crushed. One heavy thump of a knife is enough, no need to mince, unless you prefer it of course. 1. While the oil is hot (I’m assuming you’re using the same pan and the oil is still hot after draining the excess) saute the garlic until fragrant. 2. Add the rice the saute quickly, unsuring that the oil is well distributed. Make sure to use a minimal amount only. You’re aiming for lightly oiled rice. If it glistens, you used too much oil. 3. Sprinkle salt to taste, then mix. 4. Spread the rice around evenly in your pan, lower the heat, cover, then cook for a few more minutes. 5. Uncover (make sure to keep away from escaping steam), sniff then enjoy. Notes: For best results and to avoid burning, use a heavy frying pan / heavy shallow sauce pan.If you don’t have any freshly used oil available, you may use fresh clean oil. Just add more garlic, if you like garlic that is. â€¢ Diced Tomatoes, dusted with sea salt. â€¢ Scrambled eggs with kani and peas. An easy bento side dish, scrambled eggs retain their flavor well and are just as good, eaten hot or cold. The bits of kani and peas add not only extra flavor and texture, but color as well. 1. In a little oil, lightly stir-fry the kani and green peas. 3. Work a wooden spoon or heat-proof silicon spatula into the egg mix, so you’ll have rough, crumbly bits. Cook until just set. â€¢ Quail Egg Birdies. Their beaks are made of carrot bits and their eyes are black sesame seeds. â€¢ On the side is a small pack of Fukami Matcha, a Green tea-flavored chocolate stick candy by Morinaga. Love Green Tea Candies and Chocolates? I can’t find an online store with Morinaga’s Fukami Matcha right now, but perhaps you can try curbing your craving with some of J-List / J-Box’s Matcha Treats. 10 Responses to I just love Tapsilog Bentos! Ohh I love your eggs and peas, it sounds good! I might try that for my #100 bento! hi sis. is this your baon everyday??? wow, work of art ha! sarap kumain pag ganyan ang preparation ng food! yummy na, pretty pa! I love tapa! Yum! Now I’m craving, darn. Tocino for me! I had a bad memory of eating tapa once as a kid, my Grandma’s tapa were so hard, it was like eating rubber and it broke my tooth off. Hehe, looking at it again now, I also want some more! Yeah, itâ€™s a nice and quick bento filler and thanks to the added color, I daresay you can easily work it in your pretty, artistic bentos. Ay, thatâ€™s unfortunate. I love Tapa. When I was a kid, Iâ€™d eat it everyday, and still be happy. I like Tocino too, but Tapa, especially our version, is always number one for me.